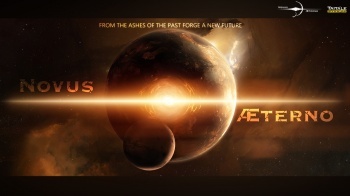 Don't let the small size of the dev company fool you; Novus Aeterno wants to be a big, big game. Secreted away in between the massive corporate booths at the Penny Arcade Expo sits a small area with a couple of demo kiosks and some art. But the size of the booth belays the aspirations of the game being demoed; a massively multiplayer sci-fi RTS with a persistent world by the name of Novus Aeterno. The game seeks to be one of the first MMORTSs to feature a truly persistent world that continues on even when you're logged off. Forgoing the traditional mission-and-objective gameplay that most RTSs use, Novus Aeterno is a bit more freeform, dropping you off somewhere in the galaxy with a core planet and a couple of neighbors. You may make your goal whatever you like; without objectives or a level system, you can focus on building and selling weapons, playing politics, or just taking the good ol' fashioned conquer the galaxy route. The game also features a strong RPG element. The player themselves takes the role of a commander, creating a custom avatar and existing aboard the player's capital ship. As the player progresses, they may upgrade their commander and his officers to provide bonuses to other ships, build better weapons, or boost the abilities of the capital ship itself. The game also allows you to design and build your own ships, deciding what weapons, armor, and abilities your ships possess and where on the ship they are placed. The placement of upgrades matters quite a bit; the backs of ships are armorless and vulnerable, so strafing and maneuvering for better position becomes an important aspect of the game. Because of the vast numbers of options available in the game, the team has given up attempting to balance the game in a traditional way, instead opting for what they call "dynamic balance." A good example of this is the weapons upgrade system: while higher-level weapons might do more damage, they will often be more finicky and difficult to use. And because all players, no matter how long they've been playing the game, have the same ship value cap, more experienced players won't be able to simply overwhelm new players with thousands of ships and will be forced to carefully choose which weapons best suit a particular situation and hope they have the skill to use them. Perhaps the most interesting use of dynamic balance is the bounty system implemented in the game. The better a player does, the higher the bounty on their ships gets; this has the dual effect of making new players nearly worthless to attack and incentivising players to team up and take out the best players, making things more difficult for the pros and easier for the noobs. The development team of Taitale games is a varied and far-flung group; each of the ten members of the company lives in completely different parts of the world including Costa Rica, Germany, Egypt, the UK, and Canada. Each member of the team has so far worked remotely from the other members, many of whom are first meeting each other in person at PAX. With such illustrious members as the lead artist on Sins of a Solar Empire and a two-star Major General, the team is bringing some high-caliber talent to creating their magnum opus. The team hopes to have a beta ready by November and a full release sometime next year, and I for one am very much looking forward to it. If everything ends up working as advertised, Novus Aeterno could turn out to be a truly great game.